Cast : William Shatner, DeForest Kelly, Leonard Nimoy, Catherine Hicks, Walter Koenig, James Doohan, George Takei, Nichelle Nichols, Majel Barrett, Mark Lenard, Jane Wyatt, Robin Curtis, Brock Peters. Synopsis: As Kirk and his crew prepare to return to Earth following the events of The Search For Spock, a mysterious probe arrives at Earth with devastating results. With Earth quarantined for the safety of all, Kirk must take his crew back in time in search of the extinct humpback whale, for it is the only creature to ever have existed that has a chance of saving humanity. Review : Brilliantly conceived Trek outing with the original series cast in pitch-perfect form, bringing their futuristic sensibilities to present day Earth: a time before computer technology had allowed us to travel beyond the stars, and before music became “civilized”, this film is filled with the warmth and humour that Trek is capable of delivering, and it took four films to get it right. Genuinely exciting, filled with great moments of laugh-out-loud hilarity, and a romance of sorts for Kirk, The Voyage Home hits a Star Trek Home Run, and remains one of the most enduring legacies of the early features. Quirky, off-beat adventure from the Star Trek crew, with Kirk and Co having to travel back through time to find a humpback whale in order to save Earth from certain destruction. A mysterious probe approaches Earth, emitting a strange signal that disrupts all communications and essentially blacks out the planet. 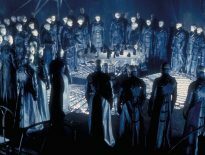 Unable to counteract the probe, Starfleet quarantines Earth from outside help, since anything that approaches the planet is quickly affected by the power disruptions. However, the message of warning reaches Kirk and his crew, currently on Vulcan and about to return home to face the firing squad (figuratively speaking) for their actions in The Search For Spock. With a newly regenerated Spock on board the Klingon Bird Of Prey, obtained by Kirk in the previous film, the crew fly towards Earth, discovering that the only way to communicate with the probe is by whalesong. And, according to Mr Spock, not just any whale, a humpback whale, which at the the stardate the film begins, is no longer a creature in existence. The crew of the Enterprise get a tan. 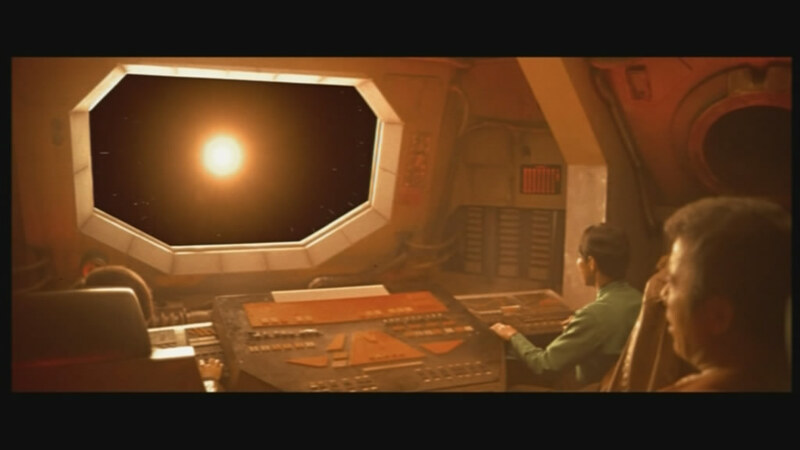 So, using their amazing scientific brainpower, Spock concocts a daring (and, some would say, foolhardy) plan to slingshot around the sun to travel back through time, in order to locate a humpback whale and return it to the future to save the world. Sounds simple enough, however, the majority of the humour in this film is derived from the fish-out-of-water scenarios our future people encounter in the “present”. Somebody of Spock’s alien heritage would immediately be out of place in today’s society, and this fact is not lost on Kirk, McCoy and Spock himself. Using disguises (which are of startlingly bad quality, laughably so) to hide amongst the population of Earth, the crew of the Enterprise discover that the Earth of today is a substantially different one to the version they know. Medicine, entertainment, science; everything appears primitive to the futuristic way of life Kirk and his crew are used to. And this is played upon with hilarious effect. Kirk discovers that there is a specimen of humpback at an aquarium in the city, and goes with Spock to investigate. 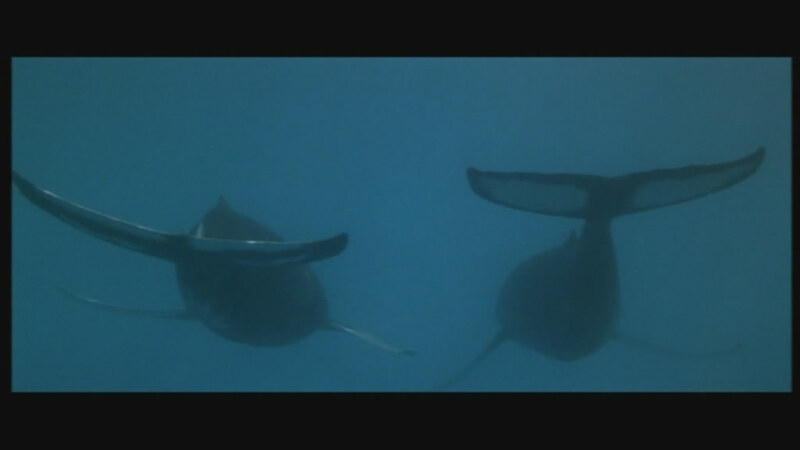 It would appear, however, that the whales in the aquarium are about to be let loose into the ocean, which will make it harder for Kirk to capture in order to return the beasts to the future. Not to mention the whaling boat just off the coast threatening to kill the whales for food. Plus, the added issue of storing the whales inside the captured Klingon vessel, which isn’t built to handle such large bulk, keeps Scotty and McCoy busy potentially altering history. 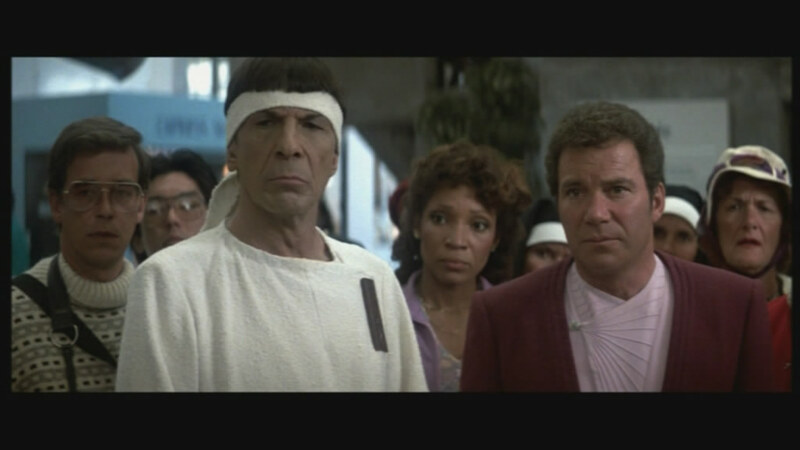 That, and when Chekov is hospitalised due to an incident aboard a nuclear powered aircraft carrier, they must mount a search-and-rescue effort to prevent him from suffering at the hands of the “butchers” at the local hospital. Perhaps the most poignant moments in the film are those between Kirk and the whale expert at the aquarium, Gillian Taylor (Catherine Hicks). Gillian is a passionate conservationist, and through her years caring for the whales has developed quite a bond with them. Initially sceptical of Kirk and Spock and their supposed intentions for her beloved whales, she soon becomes quite attached to Kirk in particular as he develops a rapport with the woman, whose mind is open to the suggestions of the fantastic that our fearless Captain engenders within her. Hicks and Shatner have quite a chemistry together, and although I feel Hicks’ role is short-changed a little by some diabolical dialogue at times, she’s more than a match for Shatner’s more effusive personality. Look sir, thar be whales here!! The script is filled with a dry, joyous wit, a sense of humour that some of the previous theatrical outings have lacked to a large degree. This time, almost everyone gets a few funny lines, as opposed to normally just giving them all to Scotty. Even Uhura, normally relegated to second-tier player in the larger story, gets her best material in decades this time round. There’s a return of the sense of wonderment the series needed, as Gillian learns of Kirks true heritage, and the fact that they’re all from the future, which isn’t hokey or contrived, but feels a lot more genuine, thanks mainly to the performance of the cast. The film is simply fun, a knockabout comedy tinged with environmental motivations, without being heavy handed or slavish to community expectations, The Voyage Home is a reminder of just how cool Star Trek can actually be. And if truth be told, it would be the last great Trek film of the Original Series’ cast aboard the Enterprise.